"This is a wonderful recipe I learned while in college. Serve with a nice crusty bread. You can make this on the stove or in a slow cooker, whichever one fits your lifestyle. Just make sure you have a 4 quart size slow cooker. Note: to make this soup less fattening omit the cream of chicken soup and one of the cans of water." In a 4 to 6 quart slow cooker, blend the cream of mushroom soup, cream of chicken soup, water, and chicken broth. Stir in sauerkraut, onion, carrots, potatoes, and sausage. Season with dill and garlic. Cover, and cook on High for 4 hours, or Low for up to 8 hours. Taste, and season with salt and pepper to your liking. Combine ingredients in a Dutch oven over medium heat. Cover, and simmer for 1 hour, or until sauerkraut is tender and soup has thickened slightly. 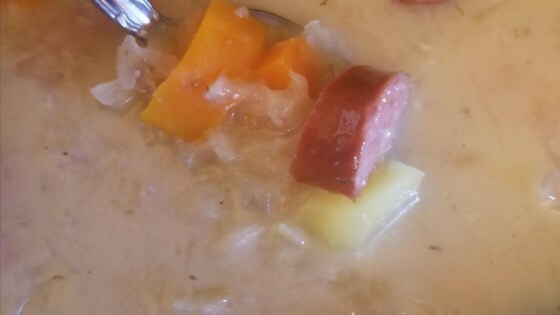 I just love sauerkraut soup, and this was Way too tart!! Terrific flavor! I made it in the crock pot. It is easy and delicious.